D’Silva, the founder and creator of the renowned Garuda Method. Please contact info@muluproductions.com for bookings & details. 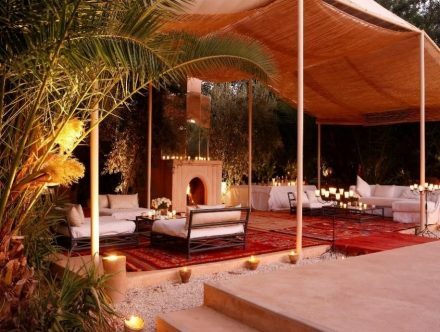 We have chosen the Palmeraie, a historic palm oasis outside Marrakech as the retreat setting and the exquisite Jnane Tamsna, as your retreat home. 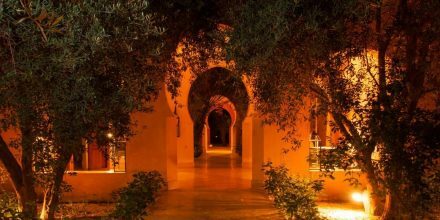 Just 15 minutes from the enchanting ‘red city’, this family-owned and operated estate offers the best of both worlds: a base from which to explore the medieval medina as well as a welcome respite from its vibrant and alluring madness. Retreat guests will have exclusive use of the private gardens, multiple pools, and the many lounge areas including expansive rooftop terraces with views of the snow-capped Atlas. We have reserved the entire property to create a catered retreat experience that is exclusively yours. At the heart of this retreat are the 8 Garuda sessions, opening with an early evening session on Day 1 (after check-in) and closing with a morning session on Day 5 (before check-out). Days 2-4 will hold two sessions daily. This schedule is designed to leave your afternoons free. You can simply relax by the pool or immerse in the rich and colorful culture around you. The choice is vast and entirely yours. Check-in is on Tuesday, October 29th at 14:00 and Check-out is on Saturday, November 2nd at 12:00. We recommend an early afternoon arrival to allow time to settle in and relax before your first Garuda session. Marrakech in end October is almost always sunny and comfortably warm. You can expect outdoor sessions under a lovely tent or on a rooftop terrace. The individually designed rooms and suites are spread across 5 villa structures, each with its own pool, terraces and the owners’ eclectic style and extensive knowledge beautifully infused throughout the lush décor and the surrounding botanical gardens. In fact, owners, MeryAnne and Gary Martin, have lovingly brought their respective talents as interior designer and ethnobotanist to life at Jnane Tamsna. The impeccable hosts and their most charming staff welcome you to an environment that is luxurious yet incredibly relaxed and informal, one that exudes cultural authenticity and pampers you with genuine hospitality. All rooms can be converted to twins and come fully equipped; many have fireplaces. Though hardly tiny by hotel standards, it is the smallest of the rooms at Jnane Tamsna. Unique in this category and at the main house, it has Moorish design elements, a queen size bed and bathroom with a shower. These comfortable rooms each have a fireplace, king sized bed, and a full bathroom with shower and bath. All 3 rooms in this category are located inside the main Jnane house. The generous rooms in this category, 9 in total, are found in the Jnane house, the Salmia villa as well as in Dar Ylane. Full of Orientalist charm, they have views of the Atlas or the gardens, king size beds, and full bathrooms. With private or shared verandas opening onto the gardens, these gorgeous suites showcase Indian and African decorative touches and are the most spacious rooms at Jnane Tamsna. A few are in the main house while the rest are found at Villa Moussafir. The two pavilion suites have well defined sitting rooms and verandas as well as the luxury of a privately shared swimming pool. Set apart in their own cottage, these suites are ideal for a family, two couples, or a group of friends traveling together. 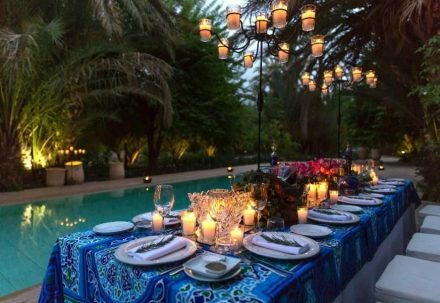 Your stay is on a half-board basis which includes daily breakfast and candlelit dinner.Mediterranean and Moroccan dishes (vegetarian and non) are prepared using vegetables, herbs and fruits sourced from the estate’s own organic gardens and nearby farm. Eat and drink what you like. This is a reTreat. Should you wish to step out for an evening on Day 2 or 3, we can arrange to replace your on-site dinner with a poolside lunch. Just inform the retreat hosts at breakfast. *Early full-payment bookings by April 30th will receive a €150 discount per room. All other standard bookings during the sales period (between April 1st and June 30th) require a 50% deposit for confirmation, with remaining balances due before July 15th 2019.